URGENT >> BULLETIN >> MOVING: (17th update 4:02 p.m.) The SEC has filed a complaint against the ProfitableSunrise HYIP “program” in federal court in Atlanta. The story first was reported by CourthouseNewsService this morning. At the same time, the PP Blog has learned that the agency applied for an emergency asset freeze, explaining that Profitable Sunrise was using a “mail drop” in England and that “Hungarian law enforcement authorities” had had frozen an account holding $11.3 million connected to the scheme as part of an “investigation of suspected money laundering.” U.S. District Judge Thomas W. Thrash Jr. granted the freeze, which applies to multiple bank accounts. 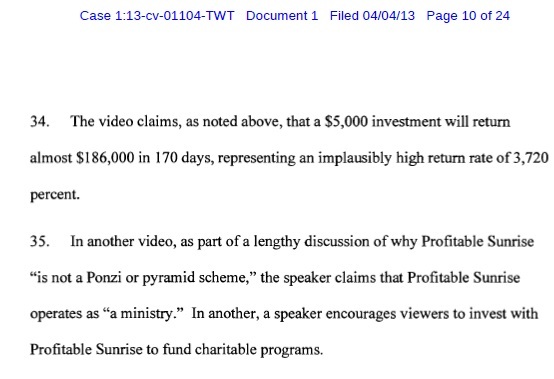 The Profitable Sunrise “referral program” operated as a “pyramid scheme,” the SEC said in its filings. Moreover, the SEC charged, Profitable Sunrise was conducting an “offering fraud” targeted at U.S. citizens and selling unregistered securities. And people pushing the “program” for commissions may not even know who they’re working for, the SEC said. 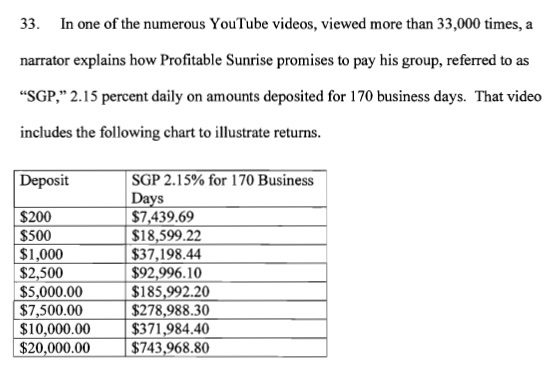 “Profitable Sunrise operates for the benefit of unknown individuals and/or organizations doing businesses through companies formed in the Czech Republic and using bank accounts in the Czech Republic, Hungary, Latvia, and China, among other places,” the SEC alleged. Melland Company SRO, Color Shock SRO, Solutions Company SRO, and Fortuna-K SRO. Absent from the list of defendants are both “Roman Novak” and “Radoslav Novak.” Although many Profitable Sunrise pitchmen have claimed that “Roman Novak” operates the company and that “Roman’s” brother “Radoslav” is its attorney, that information has not been confirmed. “There is more than a slight possibility, as with many offering frauds, that the people described in the website, including the Novak brothers, do not exist,” the SEC said. InterReef’s registered agent is based in Seychelles, an island chain in the western Indian Ocean, the SEC said. “Tens of thousands of investors” may have invested “at least tens of millions of dollars in Profitable Sunrise,” the SEC said. At least 34 U.S. states and provinces in Canada have issued Investor Alerts or cease-and-desist orders against Profitable Sunrise. Assertions online that Profitable Sunrise “generates profits by making loans to businesses at higher rates” are “false,” the SEC charged. The scheme spread in part through “social media” and “numerous promoters in the United States,” the SEC said in its complaint. Incongruities dotted Profitable Sunrise, the SEC alleged. Although Profitable Sunrise claimed it had been operating for six years, “the United Kingdom Companies House reports that Inter Reef has been in existence for only 19 months,” the SEC alleged. From the SEC complaint filed in federal court in Atlanta April 4. See filings courtesy of the ASDUpdates Blog. Before the ponzi pimp choir starts singing a rousing verse from that old standby “Oh Evil Uncle Sam” it should be noted that “Roman” ran off with the money close to three weeks before the SEC took action. If anything this action gives US based investor their best, thin hope for a partial refund (aside from suing Nanci Jo that is). Please come back and post the link once the docs are posted. Don’t get me wrong, this is good news, but lets hope to see some criminal charges against the people in the USA who promoted the scam in the name of religion. I wanna see Nanci Jo perped walked with Ken Russo and Faith Sloan not far behind. On April 4, 2013, the U.S. Securities and Exchange Commission filed an enforcement action against Inter Reef Ltd., doing business as Profitable Sunrise, as a defendant and Melland Company S.R.O., Color Shock S.R.O., Solutions Company S.R.O. and Fortuna-K S.R.O. as relief defendants. The Commission’s complaint was filed in the United States District Court for the Northern District of Georgia. The Commission’s complaint alleges that Inter Reef, located in the United Kingdom, has operated a fraudulent securities offering over the internet under the name of “Profitable Sunrise” that has been targeted towards investors in the United States. Through its website, promoters and social media, Profitable Sunrise promised investors returns of between 1.6% and 2.7% per business day, compounded daily, on funds invested in various programs that were purportedly to be used to provide loans to businesses at even higher rates. Investors have been encouraged to recruit others for the scheme with promises of percentages of the amounts put in by the new investors. Among other things, the Commission’s complaint alleges that the Profitable Sunrise has promised impossibly high rates of return and misrepresented that investments in the program were insured by a leading investment bank. The fraud appears to have been targeted at religious investors, as Profitable Sunrise’s website contained several Bible verses and the company purported to make frequent charitable donations. Melland, Color Shock, Solutions Company and Fortuna-K are Czech companies that the Commission alleges have received funds from investors in the United States through transfers at the direction of Profitable Sunrise. At present, a bank account in the name of Color Shock in Hungary has been frozen by authorities there. The Commission has named these Czech companies as relief defendants because they have no right to retain the funds sent to their accounts by investors. Shortly after the Commission filed its complaint, the Honorable Thomas W. Thrash issued an order granting a temporary restraining order against Inter Reef along with an order directing an accounting, allowing expedited discovery, preventing the destruction of documents and providing for an asset freeze. The Commission may seek additional relief, such as preliminary and permanent injunctions, disgorgement of any ill-gotten gains with prejudgment interest and civil penalties, at a later time. The court’s order also freezes the assets of the relief defendants. “Fortuna K”… shades of “Fortuna Alliance” pyramid scheme? Or fraudsters all think alike? Quick note: This story/Comments thread on the SEC’s Profitable Sunrise action now is being spammed by a would-be poster who purports to be “mark john” of the purported “markjohnfinance” at a yahoo address. The spam came in from 115.244.78.10, which appears to be in India. Looks very much like a bid to dupe Profitable Sunrise investors in a “loan” and identity-theft scam that uses famous Biblical identities.